The Chariot was invented in Sumeria, the same place that gave birth to astrology. The Mahabharata tells the story of prince Arjuna, receiving teaching from his charioteer, Lord Krishna, on a Chariot. Early Jewish Kabbalists practiced the Merkava (Hebrew for Chariot) as they ascended to higher spiritual realms. 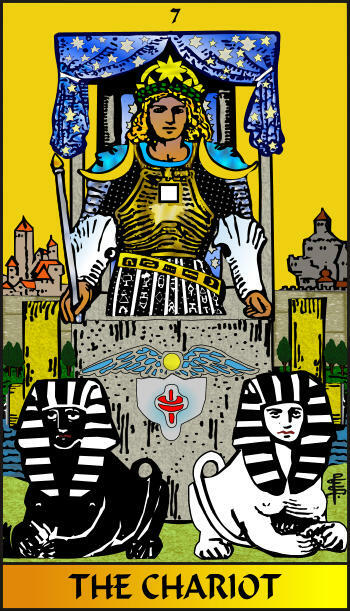 The tarot card for the zodiac sign Cancer is called the Chariot. What is the Chariot? Why is it so important, mystical, and esoteric? And why should you read about this now? HH the 14th Dalai Lama, a Cancer with Cancer rising, is considered by many to be the reincarnation of the Buddha of Compassion. He often stresses how suffering is necessary for us to learn and experience compassion. If you trace the development of Kabbalah, you will see that it correlates to the suffering of the people who conceived it. Scholars trace the early Jewish mystical tradition to the Merkava, Hebrew for chariot, that was experienced by the prophet Ezekiel when he was lamenting for the destruction of the temple (Ezekiel 1). While meditating on the river of Babylon (6 century BCE), in a place called Tel-Aviv, he had a vision of a Chariot. He understood it to be the throne of God arriving with a message. The early Hebrews believed God resides in the temple in Jerusalem, but now that it was destroyed, God is free to move around. God is on a Chariot, like a food truck that brings manna to you. God is not in Jerusalem, or Rome of Varanasi. God is mobile. All you need to do is close your eyes. Travel without movement. God comes to you. In fact, God is within you. Birth of Jewish mysticism. Birth of Kabbalah. Since that time, in Kabbalah, the code for meditation is the "the Chariot." 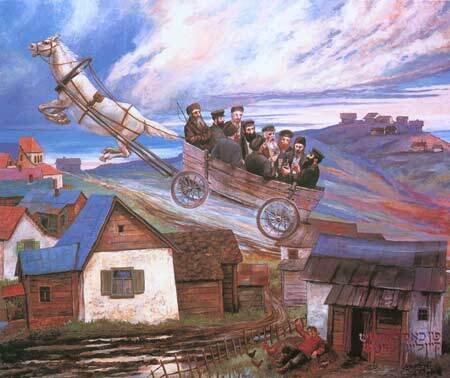 Baal Ha'Shem Tov, Rabbi Israel Ben Eliezer, (1698-1760) the wizardly storyteller who gave birth to the Hasidim movement, was known for taking his students on a carriage (chariot) not to travel from one town to the other but rather to fly into altered states of mind. In a battlefield, between two warring fractions of relatives and friends. Arjuna is conflicted, his mind is racing. Should he fight his relatives or not? He is somewhat surprised to discover that his chauffeur is actually the Lord Krishna and that he is not there to drive him around as much as to stir his soul to the right direction. Krishna tells Arjuna not to focus on the results but on the actions. Krishna asks the prince to be at one with the here and now and less in what might happen. As the Sufis say: forget the past and do not mind the hereafter, only focus on becoming. All these lessons are what we need to know when we meditate. Some mystics believe that Arjuna actually meditated in the chariot and received his wisdom from Lord Krishna during a deep contemplation. Why is Cancer the sign of meditation? Why is the Tarot card Chariot, the card of Cancer? Many of us think that we cannot meditate. That it is impossible for them to shut down the mind and experience calmness. A few days ago, while teaching a workshop on Meditation in Sofia, I was inspired by the goddess and heard myself say (yes, that happens, I hear myself say things I did not think about before): we all meditated for nine months while in our mother's womb. We were in that dark sack, in deep contemplation, meditating on becoming. For nine moons we navigated a uterus chariot, traveling without movement. Being mystical without knowing what it is like not to be one. Cancer is the sign of motherhood and birthing. The womb along with breasts are organs that are associated with Cancer. So as you can see, if you were in a womb, you meditated. It is in your DNA, in fact, it is in every cell of your body. Since you done it before, you can do it again. On July 13th, the Moon, Sun and North Node conjunct and we experience the third eclipse this year. Eclipses always quicken processes and whatever you start around the eclipse will accelerate. Since it is a new moon and an eclipse in Cancer, the sign of meditation, the 13th of July is a perfect day to REconnect to your already previously mastered meditation abilities. If you can find a place to meditate by a water source, that would be highly recommended. I will be doing it by the Limmat in Zurich. But any pool, fountain, river, sea, lake would do just fine. Give yourself the gift of peace. I wish you a great eclipse season (July 13 and 27 as well as August 11).